For the first time in ten years, the City of Seattle is bidding out $30 million of homelessness funding through an open RFP process. It’s using the RFP as a chance to rewrite the rules for service providers — and more importantly to ratchet up the requirements placed upon them. The Human Services Department has an annual operating budget of $150 million, of which $50 million is dedicated to the homeless response. About $20 million has recently been bid out through other programs, such as for the Navigation Center. The remaining $30 million will go to new contracts for services beginning in January 2018. You’ll notice that the total dollars add up to considerably more than $30 million. That’s because the city is trying to be flexible with its funding, so it can respond to the best proposals and also express a preference for providers that are partnering or collaborating rather than just working in a silo. Much of the city’s homeless response funding has previously been dedicated to repeated renewal of contracts with providers that the city has worked with for years — usually without any performance metrics attached to them and little or no effort to evaluate whether the providers are actually delivering decent return on the investment the city is making with them. All that is changing. In theory, at least, there are no favored providers any more: all of them need to go apply through the RFP in order to gain funding starting in January 2018. Further, the city changed its contracts starting six months ago to require all of its providers to collect and report performance metrics. With this new RFP, HSD will now be using those performance reports to prioritize funding for the highest-performing providers. Utilization rate of services provided. 12% of the funds committed to in a funding contract will be tied to meeting targets for each of these metrics. Providers will be evaluated quarterly, and if they don’t meet the targets 3% of the annual funding will be withheld. In a Council review of the RFP program this afternoon, Council member Burgess noted that the Families and Education Levy and the Seattle Preschool Program both use the “pay for performance” program and have found it to be very effective. It will certainly be a dramatic culture change for providers who have not been held accountable for their results for many years. 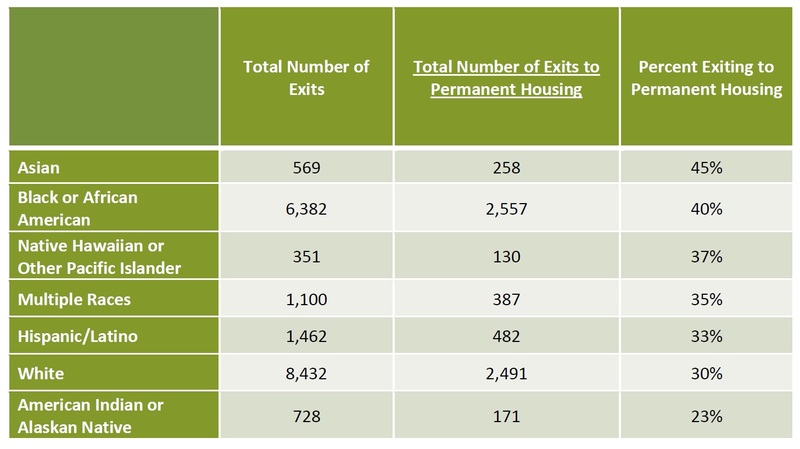 American Indians and other indigenous people have by far the lowest rate of exit from the homeless system into permanent housing. Increase the rate at which American Indian/Alaskan Native households exit to permanent housing to a rate that is comparable to other races. Increase the rate at which Black/African American households maintain permanent housing through a homelessness prevention project, or are diverted from homelessness. A provider’s ability to help drive these changes will be one of the selection criteria for funding. All providers are required to enter data into the shared county-wide HMIS system for collecting and tracking homeless people and the programs and services that engage with them. Providers will also be required to participate in the Coordinated Entry for All program to ensure that people entering the homeless system are quickly identified, assessed as to their needs, and referred to a personalized set of services to help them as soon as possible. It’s hard to exaggerate the wholesale cultural change this represents. There are providers who have built close relationships with HSD that have allowed them to avoid these requirements for many years, and in the process any real accountability. But the Focus Strategies and Poppe reports last summer pointed out in stark terms that until that culture was reformed, there would be little progress in addressing the homelessness crisis. The city promised in its Pathways Home plan that it would embrace this kind of reform, including re-bidding contracts. This morning, Mayor Murray called this new approach “hyper-coordinated,” as it represents a much tighter, data-driven approach to funding and evaluating services that will allow high-performing programs to thrive and low-performing ones to fall by the wayside. Resistance from legacy providers. We saw this clearly last fall, after the Focus and Poppe reports came out and as HSD started looking harder low-performing providers, and following federal guidelines that favored “rapid rehousing” programs over “transitional housing” programs. Legacy providers that looked like they would lose some or all of their funding started raising a stink and appealing directly to city officials to intervene and reinstate their funding. Some Council members even put forward budget amendments to reinstate funding, essentially overruling HSD’s evaluations and decisions. That temptation will be there again this fall as the Council prepares the city’s 2018 budget. Transitional housing versus rapid rehousing. The federal directive to prioritize rapid rehousing over transitional housing is still controversial. For its part, HSD says that its goal is to prioritize high-performers over low-performers, and it will continue to fund high-performing transitional housing programs. 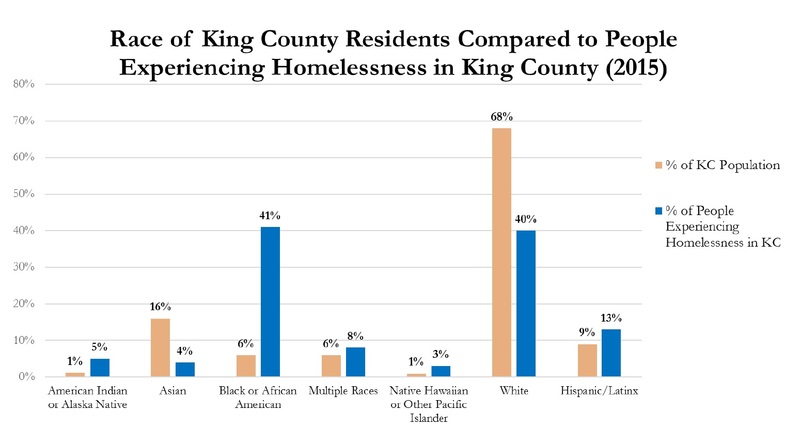 It claims that in 2016, King County rapid rehousing programs showed 68% of people exit to permanent housing, with only 3% returning to homelessness, while transitional housing programs had 58% percent exit to permanent housing with less than 3% return to homelessness. But transitional housing is a far more expensive program than rapid rehousing, so investments in rapid rehousing look like money better spent, helping more people. The counter-argument is that rapid rehousing programs, which provide rent subsidies for a limited period of time so allow people to stabilize before taking on the full burden of rent, tend to perform worse long-term in places such as Seattle where rent is rising rapidly. Also, it’s recognized that transitional housing programs are intended to help the people who are the most difficult to re-house, so a direct comparison of TH and RRH programs is apples-to-oranges. Many of the local TH providers are well connected in city hall, so don’t expect this issue to die down soon. They’re still funding overnight shelters. It’s broadly recognized now that overnight-only shelters don’t work well since they dump people back on the streets at 6am. Not surprisingly, many homeless people find it easier to live on the streets than to move in and out of overnight shelters each night. The city is prioritizing “enhanced” shelters that lower barriers and can accommodate couples as well as people with possessions and/or pets, and they are also willing to fund day shelters and day centers, but the current shelter system is still overwhelmingly based on overnight shelters and this RFP doesn’t do much to fix that. In part, that’s probably a nod to the reality that if a number of overnight shelters closed on January 1, in the middle of winter, it would provoke a new kind of crisis in Seattle. It takes a “housing first” approach, but housing isn’t enough. It’s broadly recognized that “housing first” is the way to go; once people are in stable housing, it’s possible to start addressing other issues, including mental health and substance abuse. And the RFP funds several kinds of housing interventions to help get people housed quickly. But it doesn’t fund any additional mental health or substance abuse treatment programs specifically for the homeless. While it’s true that Seattle and King County are separately trying to expand mental health and substance abuse programs for the community at large, as well as twisting federal and state officials to chip in additional funding, it’s not enough and it’s a gaping hole in the Mayor’s “hyper-coordinated” homeless response to not be funding those programs. HSD also needs to change its own culture of opaqueness. It’s not enough for HSD to demand that its providers measure and report on their performance; HSD needs to practice what it preaches. The department has been maddeningly opaque, giving few meaningful clues as to how it’s been spending its $150 million annual budget or what the return has been on that investment. I asked Mayor Murray this morning if HSD was committing to publish information on which providers it was funding, those providers’ performance statistics, and HSD’s performance on those same five key metrics in aggregate, and he said “Absolutely.” We’ll see if they live up to that promise next year. Most of the rest of this year HSD will be busy executing on the RFP and selecting its new set of providers to fund. In July, it will hold three information sessions with prospective applicants, and the Nonprofit Assistance Center will be providing free technical assistance to applicants through August. Proposals are due September 5th. In October and November, HSD’s review panels will be convening; those panels will include representatives of HSD’s partners (King County, All Home and United Way, philanthropic organizations, and the business community) as well as consumers and those with the lived experience of homelessness. The city plans to notify providers of funding awards on Monday, November 27th, with the new contracts starting on January 1, 2018. The Council members present for the briefing this afternoon (Bagshaw, Harrell, O’Brien and Burgess) reacted favorably and commented that they believed this was important progress. Bagshaw issued a statement in support today as well.